Very affordable and yummy dimsum as introduced by my sister. However, it is quite inaccessible if you come here by public transport. red star was been quite famous for their dim sum and it is located at a rather run down block. Anyway, the dimsum here is good and affordable and authentic. 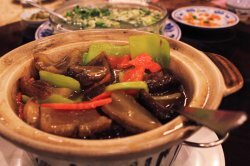 We ordered Barbequed Pork Pastry, Prawn Dumplings, Xiao Long Bao, carrot cake, siew mai etc. All were delicious but I especially like their prawn dumplings as it is very fresh and the prawns were huge. The xiao long bao taste good too as the soup inside is very nice. 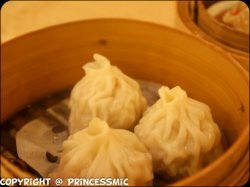 My sister and I usually called it as “soup bao” haha.The bill came up to $30+ for 2pax which I find it value for money given the standard of the food. Will definitely return and bring my friends along! 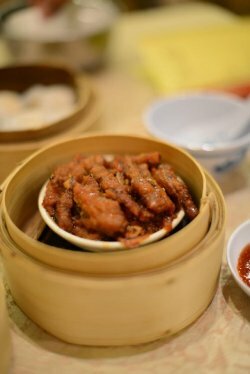 Having heard about Red Star Chinese Restaurant for a while, I was yearning to try it as I love Chinese Dimsum (Cantonese-style food of light snacks or individual portions of food served in steamer baskets or small plates). 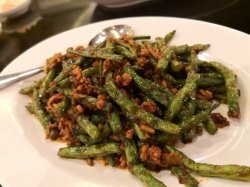 Red Star Chinese Restaurant is located at Blk 54 Chin Swee Road #07-23 Singapore 160054 and the number to dial is 6532 5266. Yes, its in a HDB block of flats, just in case you are wondering. So, that day when Katherine* suggested we go there for Ken's* birthday lunch, I immediately agreed. This age-old, authentic dimsum restaurant was always filled with patrons, but I was prepared to wait. Fortunately, that day there wasn't any queue. 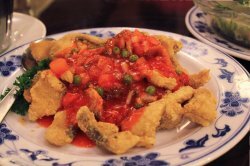 The restaurant's decor is atypical of a traditional Hong Kong Chinese restaurant - red metal-cushy chairs, large round tables covered with white tablecloth, and patterned red carpeting. It provided a very cosy and heartwarming environment. 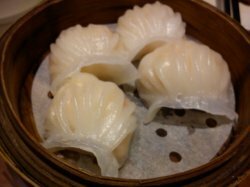 The amicable wait staff pushed went around tables with their carts of dimsum - a first time for me as opposed to the usual manual order-taking. We were hungry, so it was not hard for us to choose from the hot plates of delicacies on the metal racks. 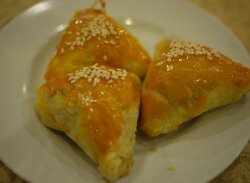 The first dish we had was the Char Siew Sou (minced meat puff pastry), a buttery, fluffy pastry filled with sweet red pork minced meat. 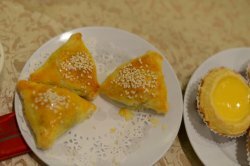 These triangular pastries came with hints of crispiness, especially around the corners, which made them immensely tasty. 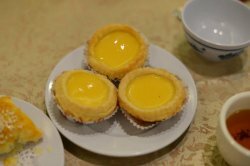 Their famous Egg Tart - baked fresh so it was piping hot from the oven, filled with eggy, fragrant, soft custard atop a soft, tart-like pastry crust. 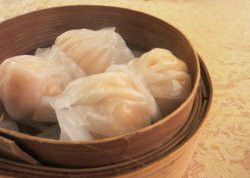 Then we had the Har Gow (shrimp dumplings) - delicious, fresh and juicy shrimps wrapped in paperthin skins and steamed to perfection. 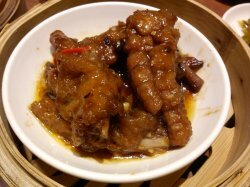 And Braised Chicken Feet - tender chicken feet with almost crispy skin, braised in a salted-sweet sauce that was very lovely. We also had the Xiao Long Baos (tiny steamed buns containing minced meat and hot soup) - a delicious squirt of soup into the mouth is always delightful. Next, the mini pieces of Pork Ribs - softly cooked in a sumptuous gravy. 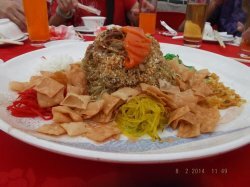 I had the Tanjong Panjar Senior Citizen Chinese New Year Lou Hei lunch. For any mass public dining, the Organizer had engaged Red Star Restaurant. The first course that everyone must have was the Yu Sheng. 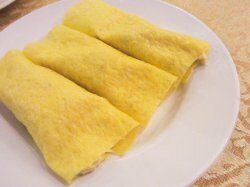 It symbolizes a dish of wealth in the Year of Horse. Necessary ingredients were prepared in the bento tray. Everyone was anxious to see what type of fish would be offered. 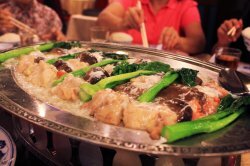 It is the golden fish – the tray of about 10 slices of salmon was top on ingredient. Wah! 10 persons to fight for the slice of salmon was not easy. Either one must be lucky and sharp to spot the salmon. Finally the Yu Sheng was tossed and did I get the salmon. Well, I was not lucky and I was lucky that I could enjoy the Yu Sheng with the Senior and bless them for longevity. The Yu Sheng was alright to the taste but It lacked of moisture such as sauce was not sufficient. 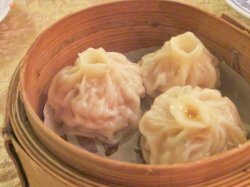 The dim sum is broadly categorized as Large, Medium and Small. Dun ask me what is what..coz I oso dunno lah! Order at your own "risk"! My favourite from the list were the bbq pork bun, the egg tarts and the bbq pork pastry. I think I have a "soft spot" for their bbq pork...haha. The bun itself had a tinge of sweetness that blended in nicely with the bbq pork. On the other hand, the pastry version provided a total different kind of texture, buttery and not too dry, which proved to be as good. The rest, I guess, were just okay. In fact, I thought the the porridge served at Royal China was better than the one here. Haha.. The prices are relatively economical as compared to other places. 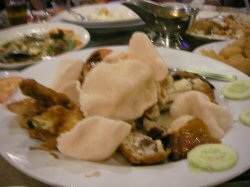 The most expensive item in my bill was a plate of roasted duck ($14) which I cant be bothered to take photo.. coz not nice lah. I wont have mentioned here, if not that the price kinda "bothered" me. 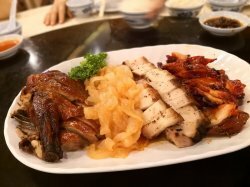 A plate of boney and cold roasted duck for $14??? I think that was a bit too much, so I dun recommend this dish. Note that this was also one of the item served in the push cart. Hardly to find a this type of classic-style Chinese Restaurant, it was still using the pushcart to deliver its Dim Sum. Coming here during weekend for breakfast, queue was a must. Obviously short-handed, service standard was not that good where I found it extremely difficult to get the staffs’ attention. Well, there were only two dishes I want introduce here. Juicy fresh Shrimp was quite commendable, it was filling. But, it was nothing special or outstanding to scream off. In fact I was quite disappointed for the visit, maybe my expectation towards it was too high. 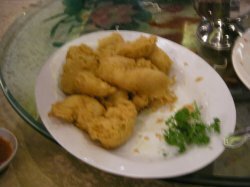 Another one would be this, it was cleaned, pat-dried, fried and coated with sweetened spicy sauce. Softly smooth in texture, it was flavourful too. Sadly, I was not too fancy about this dish. The way my friend told me about the restaurant was overly exaggerated. Anyway, it was a place suitable for family dine-in. To me, I might not be coming back again. 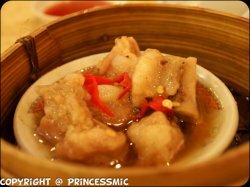 The all-famous traditional Dim Sum Restaurant that has been around for the longest time, Red Star Restaurant isn’t the most accessible of it all, but I guess it suits its surrounding location, at Chin Swee Road, just as of heritage value and traditional. About 15 years ago (damn, time flies) when I was living in that precinct, my extended family and I would frequent the Dim Sum Restaurant. Well, we lived literally just across the street, so it was rather advantageous to us beating the crowd in the morning. I know that up till today, trying to get seats in the Restaurant on a weekend morning is still as challenging as ever. 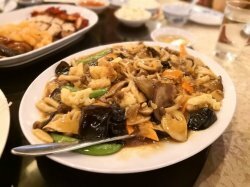 A quick recount of the food that we used to love from the restaurant, over the years (of course, it was so good we went back even after moving away from that area). It was unanimous when we agreed on how the Century Egg Porridge was a showstopper. Together with its famous Chee Cheong Fan. Those items would not be missed out from the pushcarts on each visit. They work on a system where you have a card – that paper-card will be stamped when you request for an item from the pushcart. And of which, you will proceed to the counter for payment, with the said paper-card. 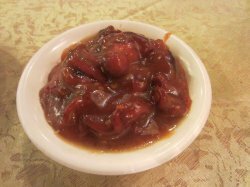 So after our recent re-visit to the Dim Sum House, we have, as unanimously as we did before, condemned on how its quality of food has plunged tremendously. 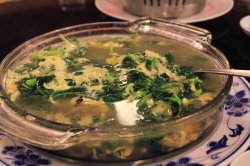 The Century Egg Porridge, for one, is now tasteless and bland, a drastic change. 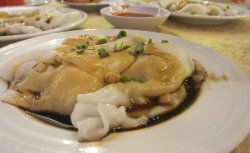 The gravy that the Chee Cheong Fan is semi-soaked in, is no longer as flavorful as before. Again, it seemed as though they ran out of salt on that very day. 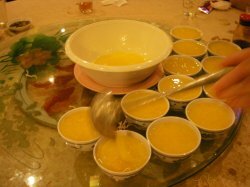 To be honest, one can easily get the similar taste, if not better, of the rest of the Dim Sum dishes. To me, it has just transformed into another pretentious Dim Sum Restaurant. Saddening. Because it is such a noisy environment, and that all the pushcart attendants are very busy and occupied, forget about the thing called service whilst you are dining here. Also, if you are still adamant on trying this place, it is best for you to walk around with the paper-card, looking for the food you want. Especially if you are sitting right at the other side of the kitchen. By the time the cart comes to you, some of the more popular dishes would already have been long out. 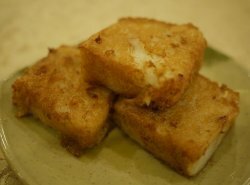 I say if you want Dim Sum, go for Swatow Seafood Restaurant or Swee Choon Dim Sum Restaurant instead. Though they might not be around for as long, they are as good, if not better. 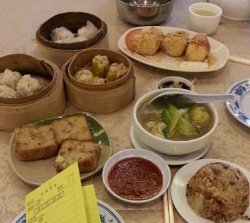 like many others, i am a crazy fan of dim sum and the best dim sum i ever had are those that i had in Hong kong. and here, i cant find any that match that standard so far lolx. however to curb my cravings, anything is good ya? 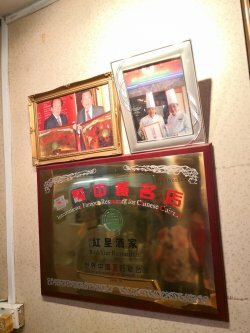 Hong xin, the famous dim sum restaurant. the place where they serve dim sum like typical Hong kong style. waitress will push dim sum carts around and u just pick your choice. very hong kong feel. hiaz. the food is so so only. not as nice as before. =(. and i feel the price is slightly steep too. 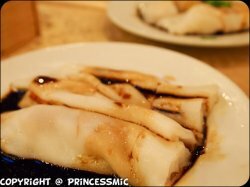 Chee cheong fun, i find the skin abit too "rough". maybe they din use finer rice flour? 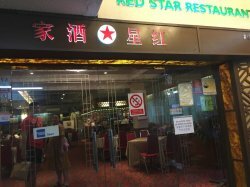 The family and I went to Red Star Restaurant because the dad had been wanting to try out this dim sum restaurant. We went during lunch hours on a weekday and there were not much people. Unfortunately, there were many items that were only available on weekends. congee push cart plain chee cheong fun - a very simple dish but it was satisfying especially since we were so hungry. The black sauce was not too salty or sweet and it complemented the bland taste of the chee cheong fun well. I like the concept of Red Star having waitresses going around the restaurant pushing carts of dim sum and other foods to diners' tables. It gave us a very authentic and traditional vibe. The har gows' skin had a mushy texture. After the first bite, I could not take a second bite as it was awful. The pork ribs were not soft enough and was a bit salty while the siew mais and tofu with prawns were fairly decent. 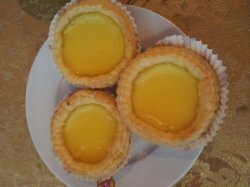 Egg tarts - the crust was very flaky and not dry. 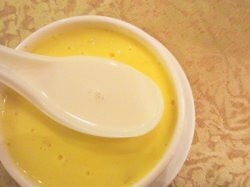 The taste of the egg custard stood out when I took my first bite. It was a tasty treat amongst all the savoury foods that we had. 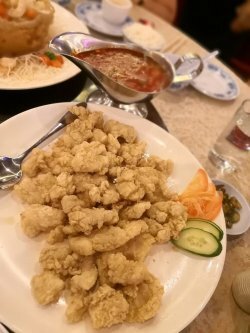 The chicken was tender but a tad oily. 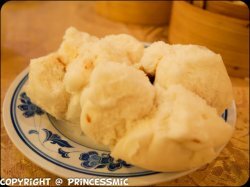 Salted Egg Yolk Bun (liu sha bao) - the salted yolk fillings had a runny consistency. It was smooth and creamy. The bun was also just about the right size and it was served to us hot. It had a stronger milky taste than the usual liu shao baos that I had tried. Congee was served in a small bowl and topped with crispy crackers and green onions. 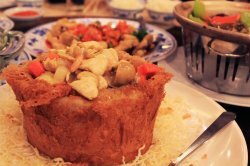 Luo Mai Gai - a savoury steamed glutinous rice dish that consisted of mushrooms, chicken and chinese sausages; literally translated to mean sticky rice chicken. The rice had a very sticky texture and was flavourful. Roasted Duck The skin was not really crispy but it was really yummy and went so well with the duck meat. 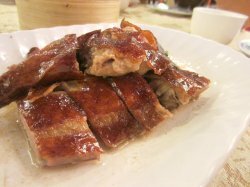 Oil was glistening under the lights but roasted duck meat are always oily right? Seafood Rolls wrapped with seaweed This was delectable and the serving portion was quite huge too but we managed to finish it up anyway. Overall, food was pretty decent and there was a balance of hits and misses. 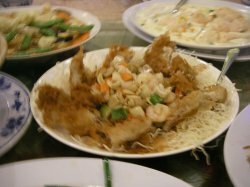 The restaurant is very big and can accommodate several large groups of people. 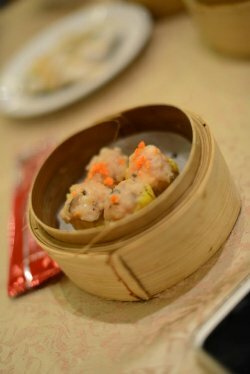 There was also a nostalgic feeling dining at a place that serves dim sum in push carts. It would not be a place for me to go and have my regular fix of dim sum because the food was not exceptionally good (mostly average) and cheap but nevertheless, Red Star Restaurant is still worth a try. There was a long queue when we reached but we did not have to wait too long to get a seat, quite impredssed with the efficiency. 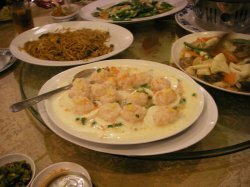 We ordered quite a lot for 2 persons, my favourite dishes were the egg tarts, scallop chee cheong fan and fried prawn dumplings. 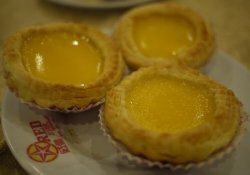 The egg tarts were crispy, fresh and not too sweet, simply yummy. 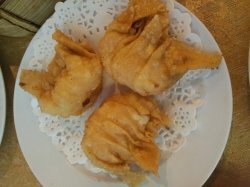 The fried prawn dumplings were fresh, crispy and flavourful, goes well with the mayo sauce. 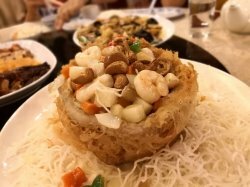 The chee cheong fan was well made and filled with fresh scallops. It was a good dining experience except that it was slightly pricey. It is located in HDB Level 7. So when i came the first time, i was very shock because from Chinatown MRT, you need walk from OG and turns right, walk straight towards old HDB,building and kopitiam.After 15 mints i reached the building and i have quite low expectation because of the surrounding and especially the old lift. Surprisingly, when the lift was open, it was the oriental-like chinese restaurant. The manager is fast and friendly, quickly arrange us to our seat. 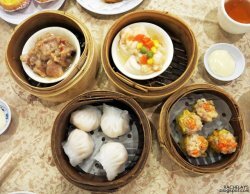 The restaurant still maintains the old style of presenting the dimsum by pushing the cart. 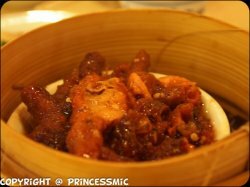 The siomay, har gao, fried prawn, feng jiao, prawn drumstick, etc are very fresh and juicy!! I love to see the folks enjoying their dim sum early weekends. This is a good place for weekends family breakfast. Egg tarts are well made. Crust is thick but its very cripsy. 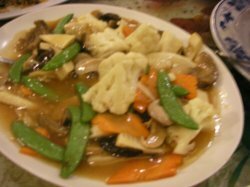 I never fail to ordered its fong zhua. Tastes sweet & spicy. The Char Siew Su fillings are good enough. Not Stingy. Its the folks that are serving us. They sounds unprofessional and like to chat in cantonese among themselves. Service is not as good as before. It's hard to find a seat and once you got a seat, there is no one to attend to you - as in give you the ordering card. Being a weekend place for folks, the place is very noisy with voices from all corners and directions. Good in the sense that there is a crowd and it has a very family feeling. Price is abit steep but i dont mind paying for such dim sum place as i like the folk's crowd. 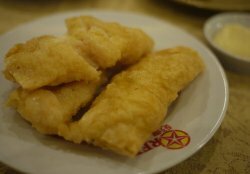 For authentic Cantonese cuisine,my family goes to Red Star Restaurant .The dishes are all my family's favourite. 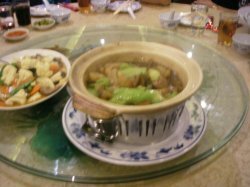 The Sea cucumber cooked with Gai Choy in an earthen pot.Sometimes the sea cucumbers are not cooked to sufficient softness for my mother and she would complain they are too hard.But this time the dish has some softer ones for her.The Gai Choy is delicious with the flavouring and freshness of the seafood.Equally fresh was the mixed vegetables of french beans and vegetarian " meat".The Tou fu topped with fish and prawn meat steamed in egg white was fragrant.It is simple yet delicious.The Yam Bowl is a must have.The bowl of vegetables, cashew nuts and bite-sized chicken complemented the wonderful yam basket. 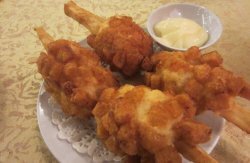 The deep fried chicken is as always soft and tender. 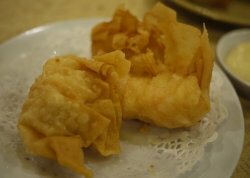 However the deep fried prawn was "bad". 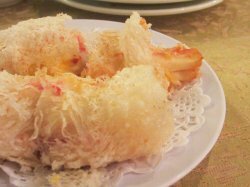 The prawn was wrapped in too much flour and my mother commented that it did not look like this when she had it way back.The dessert was mango with pomelo fruit. But it was watery.We had it at a stall and it was thicker and much nicer.It could have been so much better.The bill came up to $160. It was a great gathering with great food .